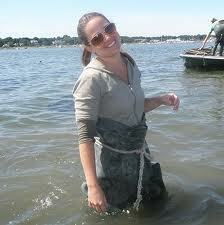 Join MOP on Sunday, August 26th from 12:00 PM to 2:00 PM in Dennis, MA as we tour Big Rock Oyster Company's oyster farm. At low tide we will walk out to the farm and learn all about oyster farming. Farm owner, Aaron Brochu and his staff will be there to provide an overview of the operation and answer your questions. 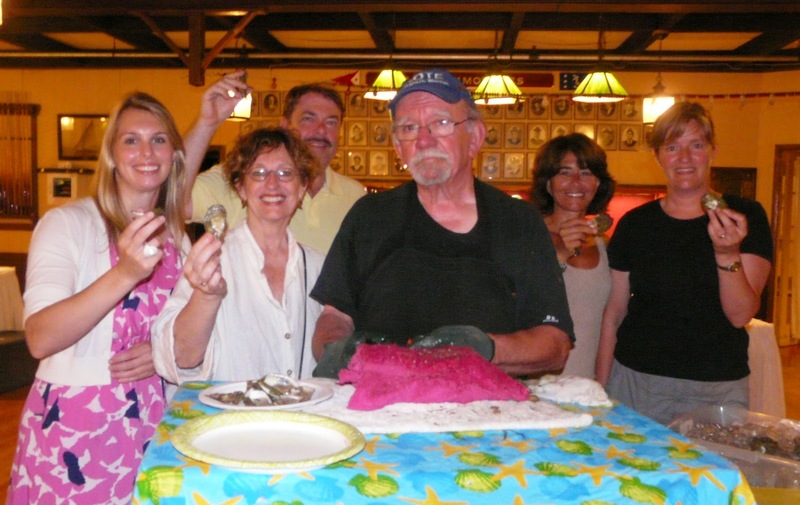 Each person will receive half a dozen oysters to sample. Additional oysters will be available for purchase. The cost is $25 per person and advanced registration is required through the MOP Store. Once registered you will receive the location of the meeting spot. 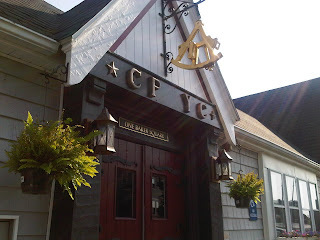 We will leave the meeting spot promptly at 12:00 PM to head a few miles by car to the farm. Space is limited to 30 people. 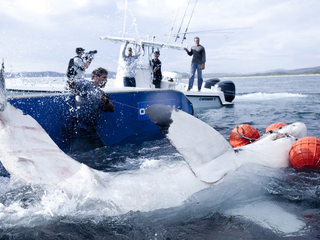 One of our Board Members is also active in shark preservation. Ben has learned that the History Channel’s “Shark Wranglers” are headed for the waters off Cape Cod. He supports the tagging efforts DMF has been conducting since 2009, but does not support the controversial methods used by the Shark Wranglers that pose risks to the protected sharks, and his group is advocating against their operating in our local waters. Please take a moment to read the petition letter, and if you agree, sign. The past two days have been a whirlwind as we had two showings of the award winning documentary film Shellshocked with the Director Emily Driscoll present to answer questions. The attendance at both events was strong and many valuable relationships were made.The film discusses oyster restoration in New York. While Massachusetts is a different geography, the benefits of oysters remain the same. In addition to Emily, Anamarija Frankic of UMass Boston and Green Harbors joined us for Q&A. In the dialog we were able to explore some of the challenges of implementing restoration programs. At the Boston Showing we were joined by staff of the Boston Harbor Association, the Martha's Vineyard Shellfish Group, The Massachusetts Division of Marine Fisheries (DMF)and the Nature Conservancy. Jeff Kennedy of the DMF graciously offered to facilitate a tour of the Newburyport depuration facility that takes the steamer clams harvested from marginal quality waters and cleans them so they are suitable for human consumption.We appreciate his being on hand to answer questions and will be working to schedule that trip for November. If the tremendous heat or the heavy showers kept you from attending and you would like to see the film, there is a copy on DVD available for viewing at the North End Library. If your organization would like to sponsor a showing, (which we recommend) we can introduce you to Emily. 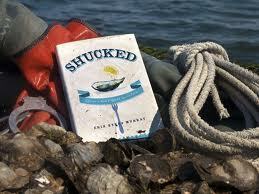 The Massachusetts Oyster Project will be presenting SHELLSHOCKED: Saving Oysters to Save Ourselves. The film follows efforts to prevent the extinction of wild oyster reefs, which keep our oceans healthy by filtering water and engineering ecosystems. Today, because of overfishing and pollution, wild oyster reefs have been declared 'the most severely impacted marine habitat on Earth' and no longer play a role in their ecosystems. Now scientists, government officials, artists and environmentalists are fighting to bring oysters back. On July 18th the film will be shown at 6:30 in the North End Public Library at 25 Parmenter Street, Boston. Immediately following the showing there also will be a discussion with Director Emily Driscoll, Dr. AnaMarija Frankic, UMass Boston Faculty and Director of the Green Harbors Project, and Author Erin Byers Murray, who chronicled a year of working at Island Creek Oysters in Duxbury in her book Shucked. She will be signing books as well. The event is Free! Erin Byers Murray at work with the oysters. Shucked The book everyone is talking about. On July 17th the film will be shown in conjunction with the Friends of the Belle Isle Marsh at 7:00 at the Cottage Park Yacht Club in Winthrop.The Club is located at 76 Orlando Avenue. Immediately following the showing there also will be a discussion with Director Emily Driscoll, Dr. AnaMarija Frankic, UMass Boston Faculty and Director of the Green Harbors Project, The event is Free and fresh oysters and adult beverages will be available for purchase. When you buy oysters buy the 100 and you have a small family, sometimes you have more oysters than can be consumed on the half shell. Thus I frequently, bring oysters to friends when we go for dinner or cocktails. Even so, we sometimes have oysters on ice seeking a home. Thus, after a bit of refinement, I have developed the perfect oyster omelet. Place oysters and oyster liquid together into a bowl. Break the three eggs in the bowl scramble well with fork. Heat frying pan- add nonstick coating of choice. Add eggs to warm pan. Fish the oysters out of the liquid and add them to the eggs. As the eggs begin to cook pour the liquid on the edge of the omelet so it touches the hot pan. Immediately cover with a lid so the warm oyster liquid/steam cooks the top of the omelet. Once set, fold in half. Realizing that duck eggs can be challenging to find I will be experiment.